Executive Home - South Facing Pool - 3 Miles to Disney - Gameroom!! This executive, six bedroom, four bath home with private south facing pool and spa is located in the gated community of Windsor Hills, and is only 3 miles from Disney. Our spacious, 2800 square foot home has a private south facing screened enclosed pool. This professionally decorated home provides excellent accommodations with only the top-of-the-line furnishings and decor including blackout window treatments in the bedrooms and oil paintings in every room! Hello - My name is Angie. My husband, Bill and our 3 children, Kylie, Chase and Ansley live in the Atlanta area. We took our first trip to Disney in 2002 and fell in love! We have been back several times every year since. After staying on Disney property a few times we decided we needed more space! We discovered Windsor Hills Resort and knew it would be the perfect place because it is so close to Disney! We hope you love our home as much as we do! We loved this location because it was near the back of the resort in the newer area where the homes have a tile roof. We also loved the south facing pool! The home is more private in the back with the high retaining wall so that you are not back to back with a neighbor. TVs in each bedroom, DVD players in most bedrooms, fully equipped kitchen, full size washer and dryer, separate shower and tub in master bath, extras: movies, games, high chair, booster seat, portable crib (pack and play). Garage used as game room with pool table, foosball, air hockey and electronic dart board. SORRY NO SMOKING AND NO PETS. This was the perfect house for our trip. We had two families with 8 total people, including 4 children under 10 years old. The house was clean, spacious and had everything we needed. It took us less than 15 minutes to get to and from the Disney parks and Disney Springs. We enjoyed downtime at the pool located at the house and also at the community clubhouse. Easy access to shopping for groceries and plenty of dining options nearby as well but we found breakfast and a couple of dinners at the house to be easiest. 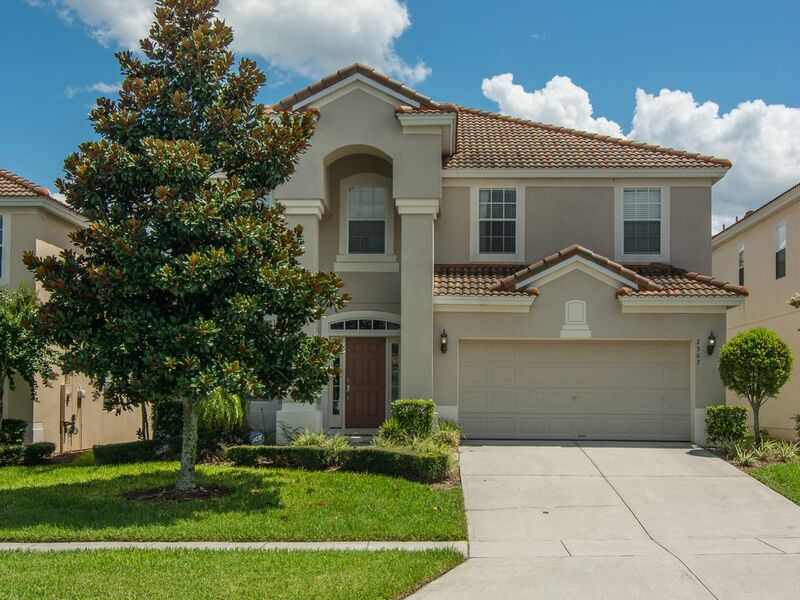 We absolutely recommend this house for any families visiting the Disney area. The owners were great as well - communicated very clearly and efficiently every step of the way. This is our third stay at Angie's home in Windsor Hills. We would not stay anywhere else. The home is exceptional. Very clean and has every amenity you would wish to have, pool, spa and game room. The owner Angie is a true professional. She takes care of all our needs. Love it. Awesome Beautiful home. Everything was great! I recommend this house for any vacation or holiday travels. The homeowners are very creative with guidelines. The house was wonderful and beautifully decorated. From the adults to the children, everything was loved everything. I wish we would have booked the home a little longer. The next time we're in the area, we're booking this home! The owner had a very nasty attitude upon our arrival. I have a 1 year old daughter and flight arrived in Orlando early. Didn’t want to chug luggage and my daughter around so decided to just wait at the home until it was time to enter. The maid that was cleaning the home asked if I would like to come in and sit at the table to get my daughter out of the sun. The owner of the home called my phone with a very nasty attitude about why was I in her home before time, once I explained to her that the maid asked if I would like to enter with my daughter she proceeds to calm down. That alone gave my a distaste for the property. Also the furniture isn’t pleasing. The couch could definitely stand to be replaced. Other than that it is in great distance to the disney parks. We had to make multiple runs to Wal Mart which is basically across the street so that was a plus as well. This guest arrived at the home around 10:00 AM, and check-in is not until 4:00 PM. There was no prior communication with me regarding early check-in, therefore I was not expecting her to arrive until 4:00 PM. I reached out to her because I wanted to confirm how she had entered the home, given the fact that the door code I provided was not valid until 4:00 PM. As an owner, it is imperative for me to protect my home. Onsite at resort: tennis, basketball, playgounds, walking trail. Rate are subject to change until confirmed. Pool/Spa Heat is included in nightly rate. 25% is due at time of booking, remaining 75% is due 30 days prior to arrival. There is no security deposit, damage waiver is in place of that.